My friend got cheated of a lot of money. 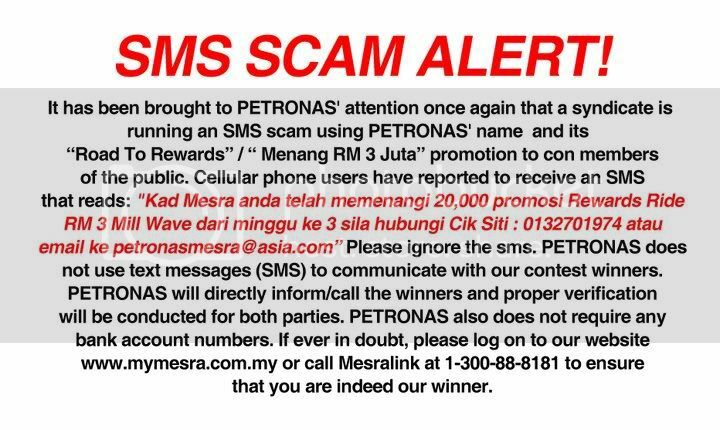 They will first sms you a message saying you have WON a contest from Petronas or something. Then after you give them a call they will ask you to bank in money to an account for them to send you the check. DO NOT GET CONNED!! Many other girls have already been suckered in like my friend who was stupid enough to actually do something like this. So to you other girls out there, DON"T fall for this kinda scam. if yu have never done anything for a certain company, then you are not able to win anything.